The national anthems were sung, though not by Jeff Jimmerson. Yes that was a void but it wasn't what was missing. Still I felt the emptiness. I closed my eyes just to listen to the crowd, waiting for the Cotton Candy Guy's voice...it wasn't there. Still I felt something was missing. Then the starting lineups were read, a voice I've never heard announced Sidney Crosby and I finally knew what was really missing. Ever since my love for the Penguins started one voice at the Igloo announced every goal, every milestone, and every "last minute of the period". The voice I knew, but the man I knew nothing of. Tears come to my eyes when I think of a Mario Lemieux goal and hearing the announcement "goal by number 66 Mario Lemieuuuuuuuuxxxxxxxxx!!!!!!!! 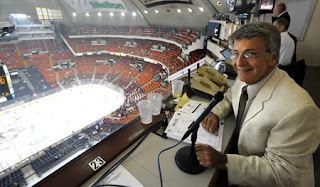 John Barbero was the Penguins Public Address Announcer for 36 seasons. Of that 36 seasons Barbero has missed about five games, so the void of his voice quite is noticeable. John was diagnosed with a disease called Astrocytoma: an inoperable brain tumor. Barbero is doing well after the lengthy chemotherapy and radiation treatments. I won't say anything bad about the new announcer with the exception of the "Power Ball Power Play"! His job isn't easy to begin with, and filling in for a legend makes in almost impossible but the fans of Pittsburgh will support him for sure. Read the Trib story here.